There is something about blue eyes that can pierce another person's soul while also acting as a revealing window into your own. Brown eyes? Not so much. What if you wanted blue eyes, though? Color contacts? Meh. Try this new laser surgery that'll permanently transform your brown eyes to blue. Brown to blue, permanently. That's what Dr. Gregg Homer from Stroma Medical in California says he can do. His Lumineyes procedure uses a laser tuned to a specific frequency to blast the brown out of eyes into blue. 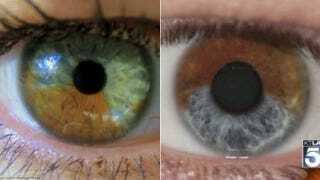 The process only takes 20 seconds too and it literally removes the melanin—the brown—from a person's eyes, which in turn reveals a blue color in two to three weeks (of course the blue isn't real, natural blue eyes have lower melanin in the front of the iris—the blue color in blue eyes come from the same effect as to why the sky is blue).